Fully Automatic At the end of a regular charging cycle, the charger automatically adjusts output voltage to a safe storage or float level, eliminating the need to always check a battery's status. JEGS has the best price on Battery Tender charging products! 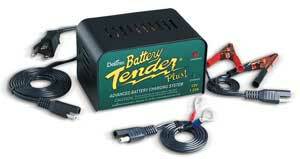 021-0128 - Battery Tender Battery Chargers is rated 5.0 out of 5 by 8. Rated 5 out of 5 by phil56 from I've had this for a few weeks and used it to charge up my car battery that had been slowly draining due to limited driving of the vehicle. It fully charged my battery over the course of two days and it is very easy to tell what mode it is in. My cousin recommended this item to me and I am glad that I purchased it. The wiring and case are both durable as well. Rated 5 out of 5 by fc2se from Amazing charger I've had this for a few weeks and used it to charge up my car battery that had been slowly draining due to limited winter drive distances. It charged my battery overnight. I really like the quick disconnect system. Also, the wiring has two options: (1) hard wired to the battery and (2) clamps. I used the clamps since I was just trying it out, but I'll consider the hard wired version for future use since it has a quick disconnect. The LED indicator is well done also, and the color key is on the outside of the case. You can easily see what the charger is doing via the LED. The wiring and case are both durable as well. This product is extremely well designed! Rated 5 out of 5 by John H from Great little battery tender Been using them for years bought two more for my other cars. Rated 5 out of 5 by Pacecar254 from Second one Second one , first one lasted 14 years , cannot ask for more than that . Rated 5 out of 5 by Wolverine from Battery Tender Very easy to install. I hooked the AC to a power outlet with an LED button. I like to use the alligator clamps on the DC wires. It slowly charges the car's battery in approximately 6 to 8 hours. Rated 5 out of 5 by dvogler from compact size Great Battery charger is it so small but powerful charge battery's fast and also maintains the battery for you . great for cars that are driven on occasional use like show cars, race cars and hot rods and classics.